Papers: In the Joseph L. Rauh papers, ca. 1913-1986, 86.4 linear feet. Clients represented include John W. Jenrette. Papers: In the Edward Lunn Young papers, 1929-1980, 54.75 cubic feet. Persons represented include John W. Jenrette. Audio/Video: In the John Light Napier papers, 1979-1982, 6 cubic feet. Collection includes two audio and one video concerning debates between John Napier and John Jenrette during the 1980 campaign. Papers: In the records of AFL-CIO Committee on Political Education (COPE), Area 3, 1947-1979, 1.5 linear feet. 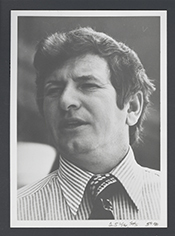 Collection includes campaign materials from John Jenrettes 1972 campaign for Congress. Papers: In the papers of Joseph L. Rauh, 1913-1994, 115.6 linear feet. Clients represented include John Jenrette. Film Reel: 1974, 7 commercials on 1 film reel. The commercials were used during John Jenrettes campaign for the 1974 U.S. congressional election in South Carolina, District 6, Democratic Party.